Somerset captain Marcus Trescothick completed a double century to help his side pile up their highest ever total against Worcestershire. Trescothick soon lost Arul Suppiah (88) on the third morning and finally fell for 203 after adding 151 for the second wicket with Nick Compton (95). 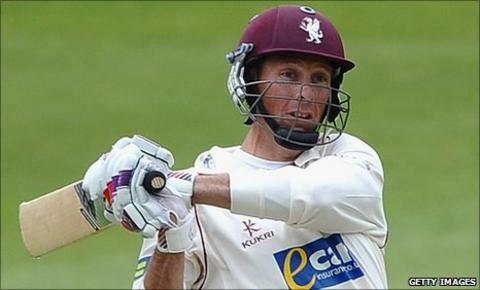 James Hildreth (67) and Craig Kieswetter (68) also contributed before Somerset declared on 591-9. Saeed Ajmal took 5-150 for the hosts, who closed on 4-0, trailing by 99. But it was Trescothick, who again took centre stage with the fifth double century of his career. Somerset had resumed on 198-0, and Trescothick's opening stand with Suppiah reached 207 before Worcestershire finally made a breakthrough. It was more down to a misjudgement from Suppiah than anything as the opener did not play a shot to an Ajmal ball that spun sharply and lost his off stump. The onslaught did not stop, though, as Trescothick put together another century stand with Compton, who passed 1,000 runs in a season for a second time despite missing out on a hundred of his own. Trescothick reached his double hundred off 293 balls, with 30 boundaries, but his batting masterclass finally came to an end when Jack Shantry had him caught by Alexei Kervezee at mid-off. Worcestershire claimed their only bowling point when Chris Jones edged Ajmal to Vikram Solanki at slip for a duck. But Hildreth and Kieswetter piled on more runs as Somerset passed their previous best score against Worcestershire of 545, made at Taunton way back in 1906, before inviting the hosts to bat for two overs before the close.